In our house, there’s a device in almost every room - and that’s without counting the ones that move around with us. They have various different form factors, and those shapes create expectations about how we’ll interact with them, and whether they’ll accompany us or wait for our return. They also govern how we want to be distracted. I think there’s a hierarchy of computing devices, from desktop to laptop, then tablet, phone, and finally wearable. You can throw in multiple sub-categories there, and perhaps e-readers, but those are the main ones. Wearables are still very new, of course, and we’re working out what exactly they mean for us. I’ve recently had an eye-opening experience in that regard. Of course, these devices aren’t just tools - they’re windows. They bring the world to us, into the workplace, and the home, and even the palm of your hand. They’re a wonder, but also a danger. With each type of device, we sacrifice a little more of the world immediately around us in exchange for the virtual one. Desktop computers are things of total immersion, where we’re almost piloting a machine. Laptops let us enter that machine from a wider variety of starting locations, and perhaps let us climb out more easily. Then we have mobile devices, which superimpose the digital world as a semi-transparent overlay on every part of our lives. We’ve been trained by these objects. We’re presented with stimuli, and we display conditioned behaviour. Notifications and interruptions permeate the membrane between actual life, and our electronic existence - and our devices are the conduits. A few days ago, I began wearing an Apple Watch, and I did so with some unease. My fear was that a wearable would be the most intrusive of all devices, bringing trespass even to situations where my phone was away, and I was engaged in other activities - eating up the last remaining uninterrupted portions of my life. I was surprised to find that, instead, the Watch helped me regain lost ground. The problem with notifications is that they occupy the junction of several unhealthy human characteristics: social pressure of timely response, a need for diversion, and our constant thirst for novelty. Mobile devices exacerbate that issue by letting us succumb to all of those at any moment. That’s not a good thing. I’m constantly horrified that much of Microsoft’s advertising seems to presuppose that working twenty-four hours per day is mankind’s long-sought nirvana. With the Watch, we’ll be waiting for a long time. For one thing, notifications are mostly read-only. Most iPhone apps don’t have corresponding Watch apps yet, so you’re simply seeing a notification without the means to respond. Even those notifications that can be handled on the device are inherently constrained by the available screen space, and input methods. For example, responses to messages are limited to assorted emoticons, dictated text, or an audio clip. The Watch’s size, and the need to raise your wrist, discourages prolonged reading, which automatically makes you filter what you deal with. On the iPhone, or any of its ancestors further up the tree, the default mode of response is now. On the Watch, it’s later. It’s difficult to explain how profound a change that is. Even in a handful of days, I’ve found that my iPhone has joined the MacBook as the “computer in the other room”, almost as if the hierarchy of devices has shifted up a level. The Watch encourages what’s presumably the most desirable and productive pattern of behaviour: a glance, possibly a brief acknowledgement via (at most) seconds of interaction, then dismissal or deferment. Equally, it actively discourages - or makes impossible - the sort of behaviour that makes mobile devices a double-edged sword: being sucked into another context, often for minutes at a time. My fear was that a wearable device would be the advance guard for yet another encroachment; instead, it’s become a bulwark. For years, our mobile applications have been so rich and fully-featured that we can spend hours using them - and so we do. They’re already our preferred form of interaction with computing devices, the internet, and each other. And the truth is, we’ve been lying to ourselves about the freedom they bring. If you’re like me, you probably hate when people phone you instead of texting or emailing. It’s intrusive, it demands an immediate response, and it ties you up for minutes at a time. I have better things to do! Let me deal with your needs once I’ve met my own. But we treat all of our notifications like phone calls. A mention on Twitter becomes a check of your tweet stream, and a response, and a few favourites or retweets. An incoming email might mutate into checking the web site in the sender’s signature, or any embedded links in the message, and indeed writing a reply. An iMessage gets an immediate response even though you can defer it, complete with half a minute of fumbling around for the perfect emoji. I’ve never appreciated my iPhone more than since I got the Watch. Suddenly, the phone has graduated from high school, and it’s off to university - it’s the big-screened device now, with the keyboard, and multi-tasking, and a vast selection of apps for every conceivable purpose. Even the most portable of laptops, like a new MacBook or an Air, now has just that little bit more of a hint of work computer about it. I’m making full use of the Watch, including all the much-touted stuff like fitness tracking, sending sketches and taps to other wearers, and controlling the music in my office from my wrist. But the revelation for me has been how this little gadget - so very clearly a 1.0 product - has changed my relationship with my other devices. In the same way that the iPhone was the first phone to really start eating away at what we used computers for, the Watch is the first wearable that’s lessened the amount of time I spend with my phone. For much of my day, the iPhone has become a sort of server, sitting quietly in a pocket, facilitating my interactions with its little brother. I was a sceptic about the Watch, most certainly - not about functionality or utility, but rather regarding the essential nature of a wristwatch, and its aesthetic character and cultural identity. If you read my earlier piece carefully, I think my position is clear, and I do stand by it. But there were two things I hadn’t realised. Firstly, I hadn’t acknowledged the degree to which a positive overall usage experience can make us willing to compromise on what we thought were sacrosanct requirements. We saw it with the original iPhone. We saw it with the first MacBook Air. We’re seeing it again with the new retina MacBook. The Watch still isn’t in the wristwatch category, aesthetically, and it’ll take a few years of technological advancement before that tension can be eased. I’ll still be reaching for my Rotary when I’m dressing for an evening out. But the Watch is something I want to wear, and I’ll miss it when I’m in a situation that calls for jewellery rather than gadgetry. Secondly, I didn’t expect that a wearable device could alter the way I experience and handle distractions, almost overnight. I’ve used the word “liberating” about every Apple device I’ve owned: the portability of the MacBook Air; the desktop-class software and mobile-class usability of the iPad; the surprising power and flexibility of our perennial life-companion, the iPhone. They’re all freeing, in the sense of letting us do the things that previously required a visit to the Shrine of the Computer, whenever and wherever we wish. But there’s another definition of freedom, and it’s a much older and more profound one: being able to walk away. Being beholden to none, and being the master of one’s own destiny, from moment to moment. To no longer be enslaved. The Watch is the first device that’s encouraged me to spend as little time as possible with it, or with any of the other electronic sinkholes around my office, my home, and in my pockets. It’s the first product that lives in this world, offering a small, brief window into the digital one - instead of being a portal that envelopes us, pulling us into another place to be held hostage by our own need for novelty and trivial diversion. The most life-changing features of the Apple Watch are that the screen is tiny, and you can’t type on it. Its flexibility lies in the need to use it one-handed. Its design triumph is that your arm gets tired after you’ve held it up for a minute or so. I think that’s what wearable computing might really be about. Not the ubiquity, for its own sake, but the rediscovery of the human scale. Devices that enhance our lives not just by letting us access the digital world, but also by keeping it at arm’s length. The Watch’s greatest strength is that it lets you put your phone in your pocket – and then does just enough to encourage you to leave it there. 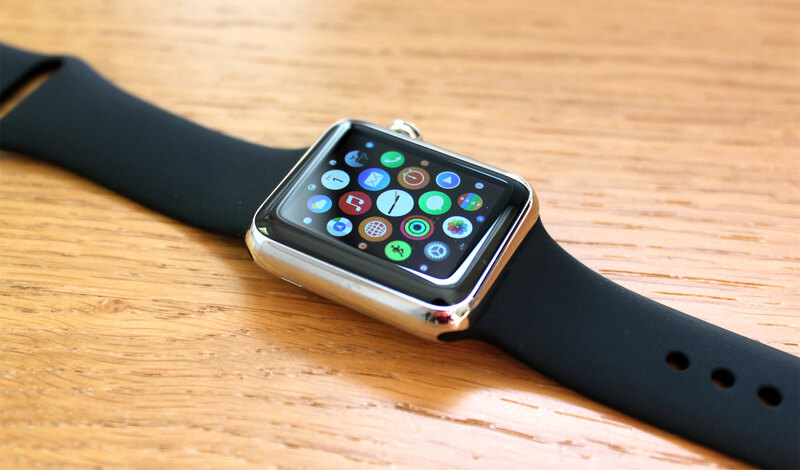 I also wrote a follow-up piece, about spending a week with the Watch.